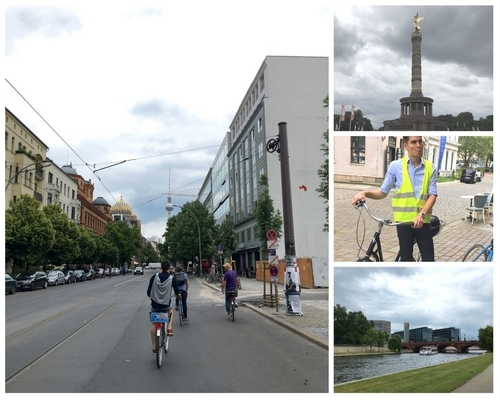 In June, the team in Berlin went on a bike tour of the city. The company that we found offered several different options, but we unanimously chose the tour named “Cool, unknown spots” that featured stops that are not on the typical tourist route. We started the tour in the historical Nikolai Quarter of the city, which was the site of the first settlement in what is today Berlin. We biked to the ruins of the Franziskaner Kloster monastery, which, due to its location over a meter below current street level, shows how the city has grown over the centuries. We then visited a model of the city, which highlighted buildings that have been built since 1990. We were amazed to see just how much new construction has been completed since the fall of the Berlin Wall. On several of the streets surrounding our office at Hausvogteiplatz, every other lot was empty until the 1990s, giving the central part of Berlin a Swiss Cheese character. Other stops on our tour included the chancellery office on the river Spree, the largest refrigerator in Germany near Checkpoint Charlie, and the former department store, Tacheles, which until recently was occupied by artist ateliers and was a mecca for Berlin’s thriving art scene. In all, the tour lasted about three hours and covered over 17 kilometers. 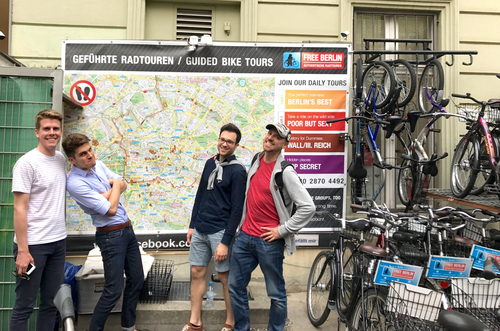 Even those team members who have been living in Berlin for years learned lots of new information about their city. We were so pleased with the tour, we are looking to book another for later in the year.